For suppliers of quality flooring and carpets in Romiley & Woodley, Out & About Carpets offer a new, customer-focussed buying experience with our “choose at home” services. Quality Laminate, Vinyl Flooring and Carpets in Romiley & Woodley – from someone you can trust. Quality assured carpets in Romiley & Woodley – with samples of the leading brands and most popular styles brought to your home. For quality vinyl flooring in Romiley & Woodley, we offer an incredible selection from varying prices to suit all tastes and budgets. Looking for laminate flooring in Romiley & Woodley? With lots of styles, colours and quality to choose from, you can’t go wrong. See recent examples of supplied and fitted carpets in Romiley & Woodley and across Greater Manchester. 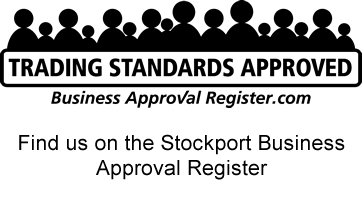 With Out & About you’re dealing with a company who’s the first to be approved by Stockport Trading Standards. Our Unique “choose at home” service is hugely popular – and we cover all areas of Romiley & Woodley. Where better to choose flooring or carpets in Romiley & Woodley- than from your own home? Normally ordering carpets or flooring means a trip down to Stockport or Hyde, high street shop, or even worse – a retail park. Looking for carpets in Romiley & Woodley? Laminate or vinyl flooring? We want to hear from you.